Court buildings can be analysed from several perspectives. First as places where justice procedures are carried out – where citizens come to resolve grievances, settle disputes or get protection; where administrative decisions are reviewed, judicial officers or juries decide on the guilt of accused persons, sentences are handed down and appeals heard. They are also workplaces for judges, court staff, support workers, ‘regulars’ like prosecutors, police, lawyers and interpreters and ‘occasionals’ like jurors or expert witnesses. Further, they may also have a less tangible role in embodying community values about the rule of law, transparency of justice or reconciliation. Is the mix of rooms and other spaces appropriate for the business of the court (and for future uses)? 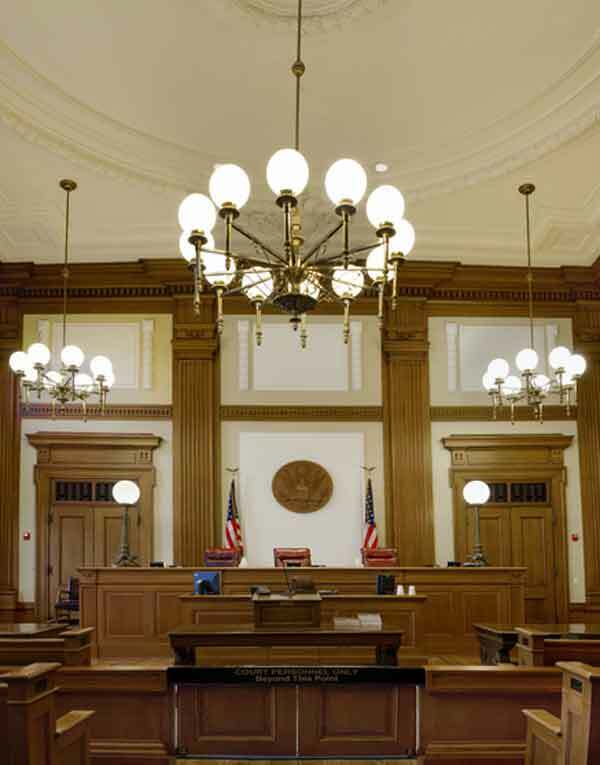 Do the courtrooms support the range of technologies required? Does the layout of the building make for effective processes? Everyday occupants of the building, to working spaces and meeting rooms, support facilities and the comfort of furniture. For the occasional visitors, the legibility of the design, accessibility of services and quality of waiting areas could be of particular importance. For all users, the air quality, thermal comfort, lighting and acoustic qualities of the building are relevant, as well as safety – both actual and perceived – from injury, accident and violence. A focus on the symbolism of the building may invite interpretation of the aesthetics, design principles and materials used in the building, such as the organisation and relationship of spaces, and the use of art. Is respect for the Crown or the original inhabitants of the land reflected in the design of the building? How important are jurors or witnesses in the delivery of justice? Are accused people seen as innocent until convicted? Are poor litigants equal to rich litigants? Are judges independent of political control?